Meet Lauren, Who What Wear's fashion editor and the co-founder of The Devils Wear Zara. Lauren is so obsessed with Zara that we started calling her the Zara Scout. Now she's turning the nickname into a franchise so she can regularly share her insider knowledge of the brand, including all her hacks, secrets and must-haves with you. We often talk about trends as if they are easy to pull off so long as you buy the right things. While that sentiment is not wrong, we often ignore how wearing certain trends will make you feel. 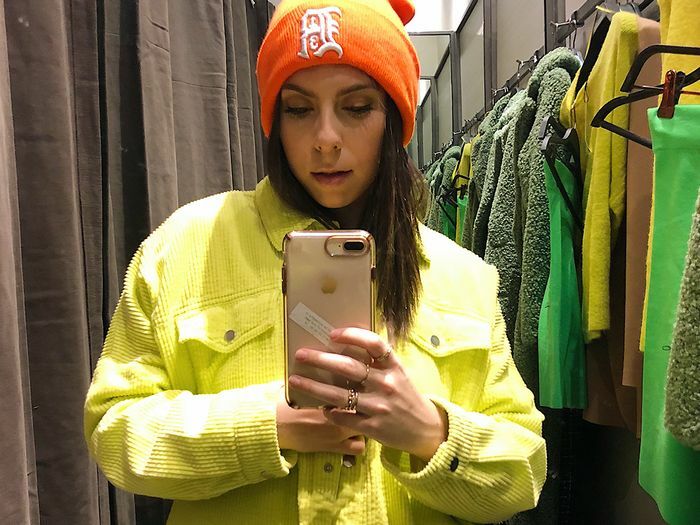 Trends like animal print and statement sweaters are typically no-brainers when it comes to styles we're willing to try, but throw something like neon and slime green into the mix, and suddenly we're not feeling so confident. Assuming you probably feel some type of way as well, we did what we do best—went to Zara and tried on all these weird trends so you don't have to. As you probably know, we view Zara as the best place to test out rising trends for the clothes are affordable and they churn out new trends at the speed of light. 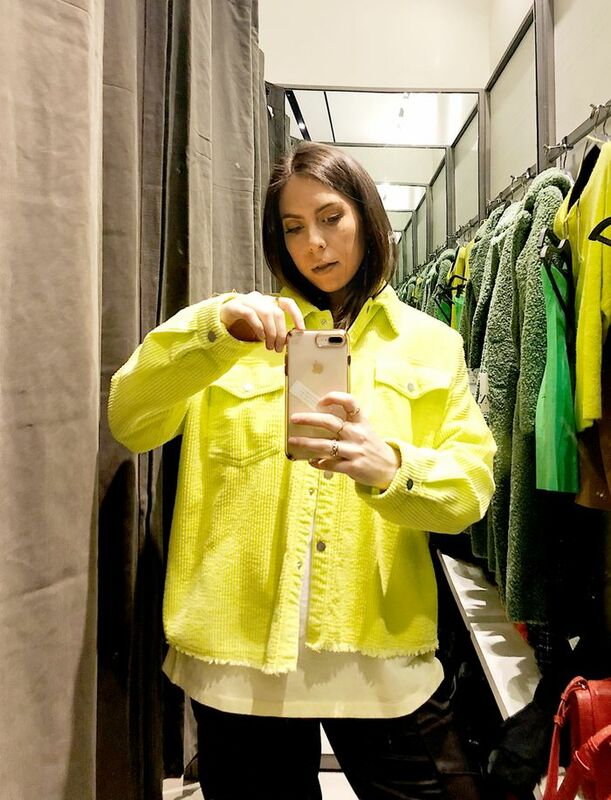 Here, Mimi and I will walk you through our semi-traumatic Zara dressing room experiences coming at you all the way from L.A. and NY and show you which pieces we actually ended up falling in love with. "I've been really nervous to buy into the neon trend, so I'd rather test the water with more affordable pieces first. This neon corduroy 'shacket (shirt + jacket) was honestly so cool. It would look good over a black turtleneck, tied around your waist, or buttoned all the way up as its own shirt. Even though it was nearly blinding, this piece was surprisingly wearable." "Thanks to Man Repeller's Harling Ross, there's a new outfit phenomenon going around that she so cleverly coined as the 'stick of butter' look. Into it. I feel like the neutral monochromatic vibe just elevates your look. This sweater has super-oversize sleeves, but the pants dress it up a bit. I'm okay with looking like food, I guess." "For some reason, I'm always attracted to clothes that look like the Grinch's body, and this green fleece coat was no exception. Soft to the touch and incredibly warm, I say why not opt for this weird colour instead of the camels and blacks that everyone usually chooses when it comes to this coat style?" "People will either think this hoodie is dope as hell or totally heinous. Honestly, I wasn't sure what side I was on until I tried it on. It has that perfect oversize feel you want with a hooded sweatshirt. Yes, the denim-hybrid look is a little weird but I feel like it could get compliments (maybe). It's one of those things you'll probably reach for every weekend because it's so comfy." "And here it is from the front." "I saw this online and thought it was cute but might be too much with all of the trends going on (PVC, chain link strap). I was wrong. Perfect mini bucket bag and would go with pretty much any look. Looks like something you'd want to Instagram IMO." "Suiting as a trend has been around for a while. To some, it may not seem exactly controversial, but the truth is that most people like the idea of wearing a suit more than they actually like wearing a suit. One of those people is definitely me. I see women wearing tailored suits of all kinds all over Instagram and beyond, but whenever I try one on in the store, I feel like I look so lame. "This skirt suit from Zara was honestly the first time I felt cool wearing a suit. The blazer is unique in that it is collarless with boxy shoulders and the miniskirt fits just right with a high-rise waist, belt loops and pockets." "I also tried the blazer on with my jeans and black long-sleeve shirt I was wearing while shopping to see if it looked good all alone, and it does. In other words, my friends and co-workers will be seeing a lot of these two pieces in the coming weeks." "Another perfectly oversize sweatshirt. I feel like this is the tie-dye trend for beginners—it's not too crazy because it's pretty neutral based. Could wear with a skirt, jeans, over a dress… the list goes on." "Tie-dye is really cool and can be really easy to wear if you buy the right pieces. Clearly, Mimi and I love oversize shirts and oversized anything that kind of makes us look like punk skater girls even though we could not be farther from that aesthetic. I digress. This shirt was soft and the ombre effect on the tie-dye really stands out. So I bought it." I paired it with these silk cargo pants that have pockets and snap closures at the ankles. It's hard to see in this pic, but they are legit (and only $40, fam). This is an outfit I will be wearing on repeat. "With the right hair and makeup, I could look like an extra in a Tim Burton film in this. Since my life is not a movie, I will probably style this with combat boots and a denim jacket around my waist. Shouts to Zara for making outfits very easy with the two-piece sets these days."